Oh well, I guess that just means I'll have to get my hands on some more CaterpillarGreen Yarns. Cat has recently released a handful of new colourways to her line up and a few of them have really caught my eye (as well as some of the older ones). It's just a matter of narrowing down the selection. Oh, and finding the time to turn all those skeins into socks! Times like these make me really wish I had a CSM (circular sock machine) to churn out all my plain vanilla socks for me, as I'm pretty sure you're all sick and tired of reading about nothing but plain vanilla socks from me! Don't worry. I vow that the next pair of socks I cast on will not be plain vanilla. Or at least I'm not planning on it. When I joined the Socks With Sarah KAL I had written out a list of sock patterns that I would like to knit up this year, along with the sock yarn/colourway that I had in mind for it. I had somewhat planned to knit a pair of socks a month, maybe two pairs if they were of the plain vanilla variety. Of that list I've only knit two of the patterns (Sunday Swing and Jeck) before switching gears over to plain vanilla. This is not really by conscious choice though. I totally blame the yarns that have been sitting on my night table, they're all self-striping and they're all just begging me to knit them up. And with colourways like this Concrete & Tulips, can you blame me? I'd love to see a photo of your finished Windswept! If you have time! I dont get bored of vanilla socks, especially when they are so flippin cool! Love self stripping! Haha, that's what I like to think too! 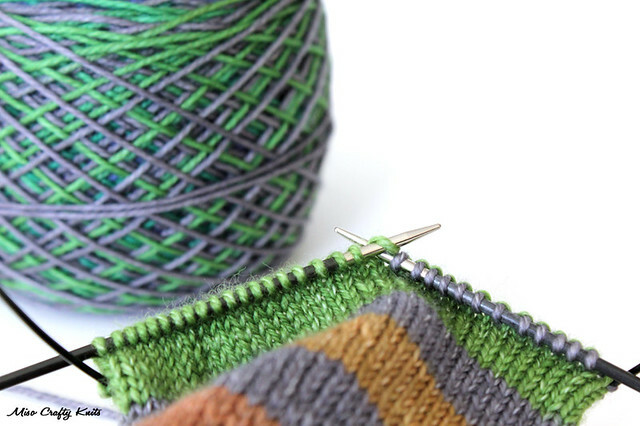 You really can't go wrong with self-striping yarn and a plain vanilla sock pattern! 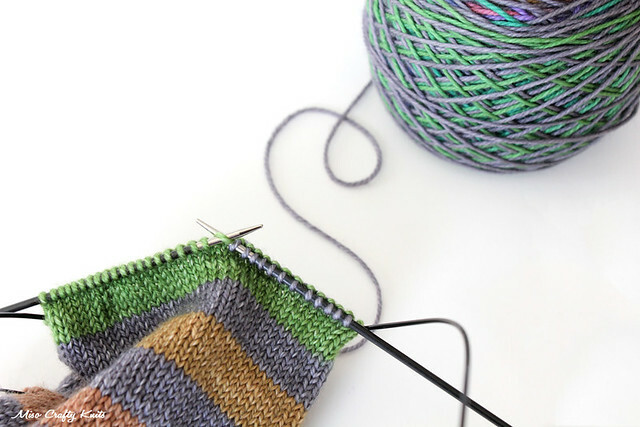 Vanilla socks are such a great way to show off lovely colourways (especially striping ones) – who could get bored of that!? I've been seeing Concrete & Tulips popping up all over the place and I think I've just lost my ability to resist it.